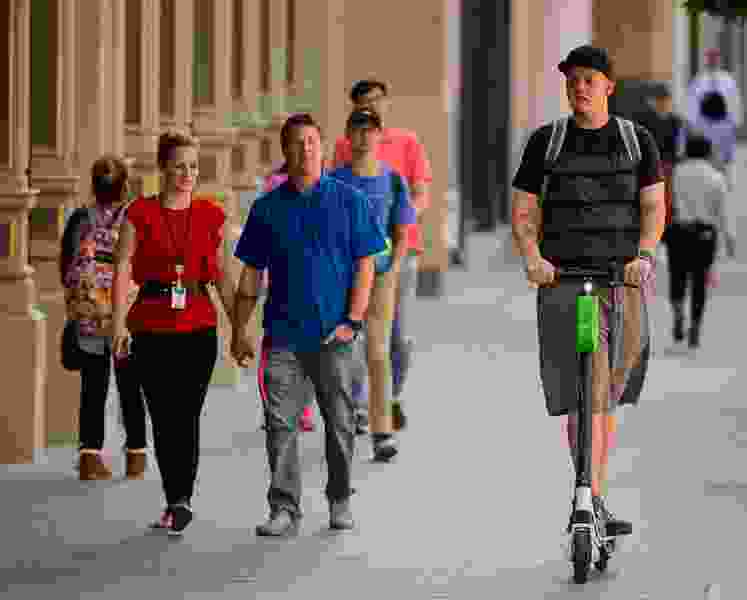 (Trent Nelson | The Salt Lake Tribune) Scooters have become a common site in downtown Salt Lake City, Monday Sept. 10, 2018. As injured electric scooter riders pour into emergency departments around the country, doctors have scrambled to document a trend that many view as a growing public safety crisis. A detailed statistical portrait of that crisis won't be available for another year, emergency physicians say, but some early samples are beginning to emerge. In Salt Lake City — where dockless e-scooters have been on city streets since June — one hospital says it has seen a 161 percent increase in the number of visits involving scooters after comparing its latest statistics with the same three-month period a year earlier. Between June and September 2017, physicians at University of Utah Health’s emergency room treated eight patients injured by scooters, though each of those were likely people’s personal devices and not the electric fleet vehicles owned by companies like Bird, Lime and Skip. During the same period this year, that number had climbed to 21, according to Troy Madsen, who practices at the University of Utah Health’s Emergency Department. "Most of the patients with these injuries specifically reported that they were riding an e-scooter or a rental scooter," Madsen said, noting that they ranged in age from 20 to 50 years old and were often injured attempting to catch themselves in a fall. "Interestingly, more than 80 percent of the injuries this year happened between Aug. 15 and Sept. 15, which would correspond with the increasing popularity and availability of the e-scooters." "It's worth noting that these were only emergency department visits," he added. "Patients with more minor injuries may have gone to an urgent care, and the patients we saw were likely those with more significant injuries who required a higher level of care in an emergency department." The hospital reported that nearly half of this year's injuries were fractures and dislocations of ankles, wrists, elbows and shoulders, as well as several cases of sprains and lacerations. Emergency physicians also treated several head injuries, and multiple patients told doctors they were intoxicated when they were injured and not wearing a helmet. Emergency physicians noted that their statistics may represent a fraction of Salt Lake City’s e-scooter injuries. University of Utah Health’s Utah emergency department is “fairly close to the downtown area,” where most rentable scooters are located, but there are other emergency departments even closer, Madsen said. Emergency physicians in a dozen cities around the country have told The Post that they are seeing a spike in scooter accidents. In seven cities, those physicians are regularly seeing “severe” — including head traumas — that were sustained from scooters malfunctioning or flipping over on uneven surfaces as well as riders being hit by cars or colliding with pedestrians. Some safety experts have raised questions about the gig economy workforce companies like Bird rely on to maintain their growing fleets. The company has posted ads on Craigslist seeking mechanics that say experience is not necessary in addition to providing training for new hires via YouTube videos. Videos posted online show Bird scooters with accelerators stuck in place and with wobbly handlebars and loose brakes. "I just signed up to be a Bird mechanic," one mechanic says on camera. "I realized there are a very large amount of scooters with problems." Last week, The Dallas County Medical Examiner’s Office revealed that a 24-year-old man who fell off a Lime scooter on his way home from work this month was killed by blunt force injuries to the head. Hours after Jacoby Stoneking’s death was ruled an accident — likely making him the first person to die riding one of the electric mobility devices sweeping the nation in recent months — a 20-year-old man in Washington, D.C., was struck by an SUV while riding a Lime scooter on Friday. Firefighters worked to free Carlos Sanchez-Martin, of Silver Spring, Md., who was dragged about 20 yards and pinned under the silver SUV. Police said Sanchez-Martin later died after being transported to a local hospital. Scooter companies have repeatedly maintained that safety is a top priority. They say their apps and labels on the scooters contain basic safety information, as well as training instructions. Bird requires users to upload a driver license and confirm they’re at least 18 years old. Lime, Bird and Skip have programs that give helmets to riders who request them, and Lime notes that riders must go through an "in-app tutorial" on helmet safety to unlock one of the company's scooters for the first time. “Helmets are recommended for use of the e-scooters, and I would reinforce this after seeing some of the cases of head injuries that we’ve treated in our emergency department,” Madsen said.